Esomiz-20 (Esomeprazole) is a Proton Pump Inhibitor (PPI) used to treat heartburn, or gastroesophageal reflux. It may be used in combination with two antibiotics to treat helicobacter pylori (h. Pylori infection) and duodenal ulcers. It may also be used to treat other conditions as determined by your doctor. Esomeprazole prevents the production of acid in the stomach. It reduces symptoms and prevents injury to the esophagus, stomach, or intestines in patients with gastroesophageal reflux disease (GERD) or ulcers. Take Esomeprazole capsules orally. Follow the directions on the prescription label. Swallow the capsules whole with a glass of water; do not crush, break or chew. The capsules can be opened and the contents sprinkled on applesauce or yogurt, given with fruit juices, or swallowed immediately with water. Do not crush the contents into the food. Esomeprazole works best if taken on an empty stomach at least one hour before a meal. Take your doses at regular intervals. Do not take your medicine more often than directed. Side effects that you should report to your prescriber or health care professional as soon as possible: chest pain or tightness; dark yellow or brown urine; shortness of breath; skin rash; unusual tiredness or fatigue. Side effects that usually do not require medical attention (report to your prescriber or health care professional if they continue or are bothersome): headache; diarrhea or constipation; flatulence (gas); nausea/vomiting; dry mouth. It can take several days of therapy with esomeprazole before your stomach pains improve. Check with your prescriber or health care professional if your condition does not improve, or if it gets worse. You can take antacids for the occasional relief of pain unless your prescriber or health care professional tells you otherwise. 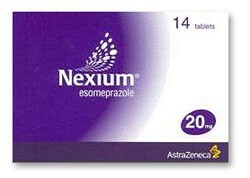 Nexium is usually handled and stored by a health care provider. if you are using Nexium at home, store Nexium as directed by your pharmacist or health care provider. Keep Nexium out of the reach of children and away from pets.